Bob Ambrogi, a Massachusetts lawyer and journalist, interviewed Skolkovo's head of legaltech, Anton Pronin, and legaltech expert Holger Zscheyge at the recent Skolkovo LegalTech event. To listen to the interviews, visit www.lawsitesblog.com, where they were first published. In the latest episode of LawNext, we take you live to Russia, where I interview two of the leading experts on Russian legal technology to get their insights and perspectives on the state of innovation and development there. What they say may surprise you. Anton Pronin, organizer of the Skolkovo LegalTech conference and head of legaltech at Skolkovo. Photo: Sk.ru. 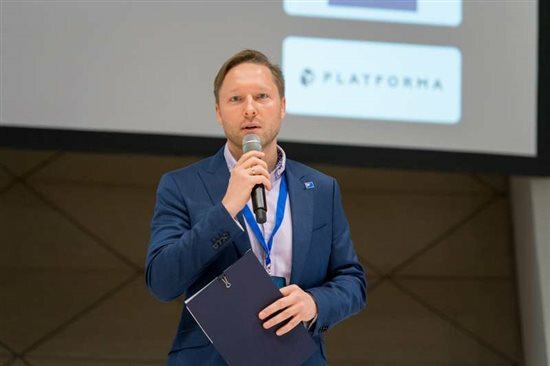 Holger Zscheyge, managing director of the publishing company Infotropic Media and organizer of his own legal tech conference, Moscow Legal Tech. Zscheyge is widely regarded as the leading authority on legal technology in Russia. Anton Pronin, organizer of the Skolkovo LegalTech conference and legaltech director of the Skolkovo Innovation Center, where he helps incubate and advise legal technology startups.